What can metagenomic sequences tell us about their environment? The ability to generate, store, process, and replicate information is one the defining properties of living organisms. In the words of Andreas Wagner, “organisms live and die by the amount of information they acquire about their environments” . As we all know, the genome sequence codes for genes that when expressed as proteins perform most of the functions that living organisms are known for. For example, they may help bacteria uptake nutrients from their environments, metabolize, create biomass, and replicate. Similarly, a metagenome sequence contains information about the growth preferences of all the micro-organisms found within it. Microbial metabolism is a process with many degrees of freedom, especially in a complex environment. This makes it difficult to model, but luckily there are also a great deal of constraints that reduce the degrees of freedom. For example, we can identify many of the metabolic functions that are encoded on the microbial DNA and the stoichiometric balance in the chemical reactions between the metabolites. Modeling these constraints can reveal a subset of achievable states that a community could exhibit. With these guiding principles in mind, we decided to tackle a very fundamental question. By analysing a metagenome (c.q. the relative abundances and functions of the microbes found in a metagenomic dataset), can we predict which metabolites were present in the environment where the sample was taken? We wanted to answer this question with a modeling approach that was unsupervised with respect to the environment and that integrated the information about the metabolism and the relative abundances of bacterial species. We implemented a bottom-up strategy with no community-wide objective, where each modeled bacterium optimally uses its genetically encoded functions to create new biomass from the metabolites provided by its environment. However, the search space for the metabolic environment is massive, each metabolite effectively serving as another dimension that complicates the search. Thus, we included a heuristic into the algorithm to search this highly dimensional space effectively for the metabolic environment that best explains the metagenomic data. After implementing the model, we were excited that we could actually find consistent metabolic compositions for several major human body sites. You can read all about these results in our paper, but one of the most exciting result was to find by modeling that the skin was enriched for metabolites that are commonly found in cosmetics. In other words, by combining skin metagenomes with detailed genome annotations, we confirmed the enrichment for cosmetic ingredients on skin, confirming a recent high-throughput metabolomics study  by only using recycled data! 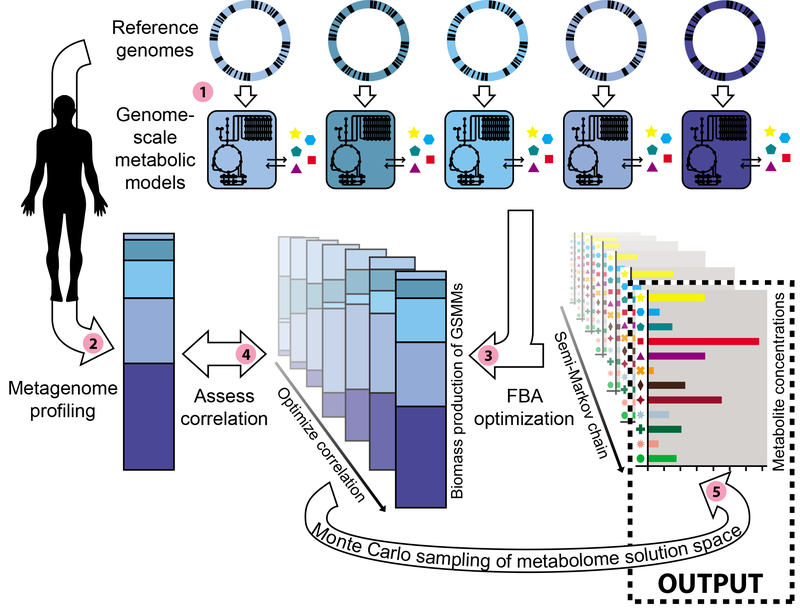 We are excited about the prospect of using metabolic models to gain knowledge about microbial communities and their environments, as well as other secrets that remain hidden in metagenomic datasets. Wagner 2007 “From bit to it: how a complex metabolic network transforms information into living matter”, BMC Syst Biol. 1: 33. Bouslimani et al. 2015 “Molecular cartography of the human skin surface in 3D”, Proc Natl Acad Sci USA 112: E2120-9. doi: 10.1073/pnas.1424409112.